hi guys! i just had to post this. for me it really stirs the imagination. enjoy! 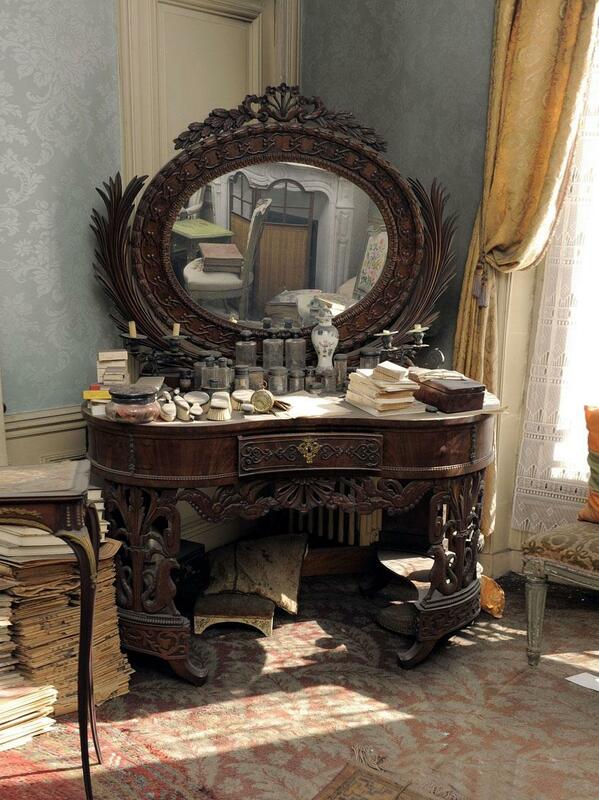 Mrs de Florian, a ‘demimondaine’ never returned to her Paris flat after the war and died at the age of 91 in 2010. Behind the door, under a thick layer of dusk lay a treasure trove of turn-of-the-century objects including a painting by the 19th century Italian artist Giovanni Boldini. The woman who owned the flat had left for the south of France before the Second World War and never returned. But when she died recently aged 91, experts were tasked with drawing up an inventory of her possessions and homed in on the flat near the Trinité church in Paris between the Pigalle red light district and Opera. Entering the untouched, cobweb-filled flat in Paris’ 9th arrondissement, one expert said it was like stumbling into the castle of Sleeping Beauty, where time had stood still since 1900. “There was a smell of old dust,” said Olivier Choppin-Janvry, who made the discovery. Walking under high wooden ceilings, past an old wood stove and stone sink in the kitchen, he spotted a stuffed ostrich and a Mickey Mouse toy dating from before the war, as well as an exquisite dressing table. 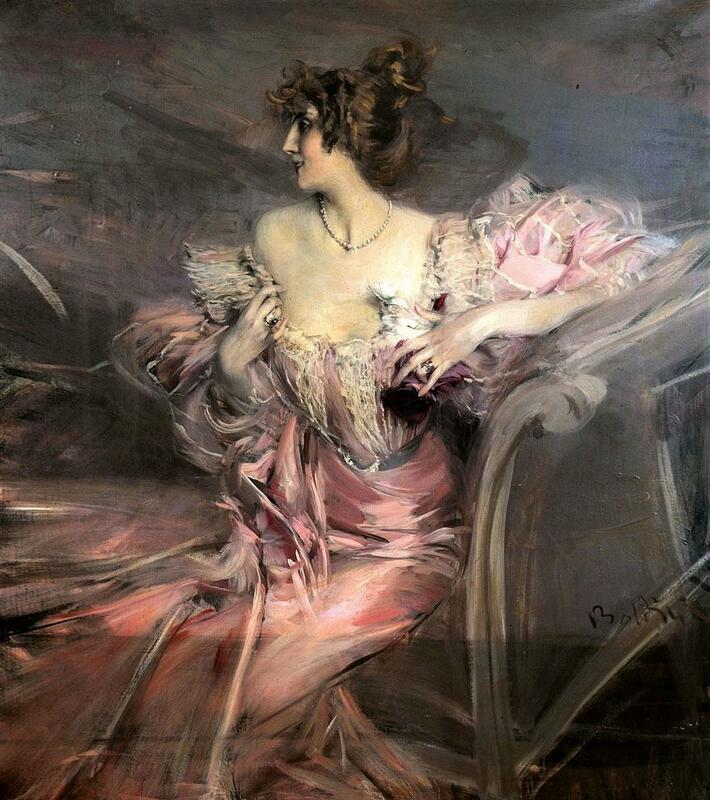 The painting was by Boldini and the subject a beautiful Frenchwoman who turned out to be the artist’s former muse and whose granddaughter it was who had left the flat uninhabited for more than half a century. The muse was Marthe de Florian, an actress with a long list of ardent admirers, whose fervent love letters she kept wrapped neatly in ribbon and were still on the premises. 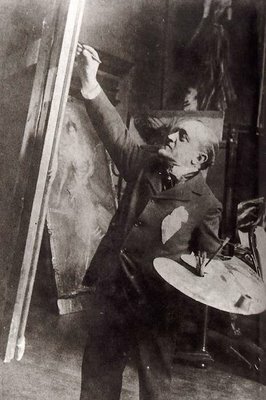 Among the admirers was the 72nd prime minister of France, George Clemenceau, but also Boldini. The expert had a hunch the painting was by Boldini, but could find no record of the painting. “No reference book dedicated to Boldini mentioned the tableau, which was never exhibited,” said Marc Ottavi, the art specialist he consulted about the work. When Mr Choppin-Janvry found a visiting card with a scribbled love note from Boldini, he knew he had struck gold. “We had the link and I was sure at that moment that it was indeed a very fine Boldini”. He finally found a reference to the work in a book by the artist’s widow, which said it was painted in 1898 when Miss de Florian was 24. The starting price for the painting was €300,000 but it rocketed as ten bidders vyed for the historic work. Finally it went under the hammer for €2.1 million, a world record for the artist. “It was a magic moment. One could see that the buyer loved the painting; he paid the price of passion,” said Mr Ottavi. October 7, 2010. Tags: Floiran. Paris, Paris Apartments. I JUST read this at paris atelier … wow!!!! October 7, 2010 at 2:23 am. Permalink. September 21, 2011 at 8:47 pm. Permalink. Way to think! So, so true. Instead people are profiteering off of this intimate family artifact. Where is that money going? Certainly not to the dead owner or the dead painter. September 30, 2011 at 1:37 pm. Permalink. Youre joking right? Shes dead. Hes dead. I kinda doubt they care what happens to their stuff. July 25, 2013 at 9:35 pm. Permalink. August 6, 2014 at 10:21 am. Permalink. Oh. My. Goodness. I would love to go into this apartment and see everything. Such lovely things. October 7, 2010 at 2:27 am. Permalink. What a haunting and beautiful story. I suspect the gorgeous Boldini painting was not the only lovely item left behind. October 7, 2010 at 2:28 am. Permalink. October 7, 2010 at 2:53 am. Permalink. You have to remember, France after the war was very different, as any country under occupation would be. I would imagine that for some people it was impossible to imagine a city so drastically different from the city they left, that to return was an impossibility. September 19, 2011 at 4:28 am. Permalink. November 3, 2011 at 7:45 pm. Permalink. What do You mean, very different? The Germans had been ther for a few years but they did not change anything as far as I know. January 10, 2014 at 4:25 pm. Permalink. Hans, oh never would the “Germans” change Paris, it was occupied by Nazi’s. Have you lived in an occupied country? Have you read any history about things before 1980? January 13, 2014 at 3:58 pm. Permalink. Strange the net curtains are modern,what about gas and electric bills? January 17, 2014 at 3:44 pm. Permalink. Lol! I just read your comment and then popped over to read the post! We are on the same wave length! Oops! What a romantic story! Can you just imagine the incredible objects left there!?! I wonder if there were jewels or clothing and did you see all of the other art. Le sigh!!! I was more interested in trying to see all of the little details in the photo than anything else. The falling wallpaper and those curtains! I love that there is still magic in this world. October 7, 2010 at 2:54 am. Permalink. The Apartment is Absolutely perfect. Miss de Florian must have really wanted to perserve Very Happy Time in her young life. I have family that lived in Europe during WWII. July 1, 2011 at 4:40 pm. Permalink. What an amazing story, like a fairy tale! It would have been so amazing to be the guys who got to catalog the apartment. October 7, 2010 at 3:07 am. Permalink. Fascinating! Don’t you wish it could all be left as is? I’d love to come peak in that room left for all those years. They should just rope it off with fancy velvet ropes and let people come view it like art in a museum. October 7, 2010 at 3:12 am. Permalink. September 16, 2011 at 12:50 am. Permalink. November 8, 2012 at 8:23 am. Permalink. I absolutely agree. Instead we have people “curate” rooms like this based on old photos. Here is a REAL one. It should definitely have been left alone. Cleaned, roped off, charge admission, but left alone. January 20, 2013 at 7:32 pm. Permalink. November 22, 2014 at 8:56 pm. Permalink. What an amazing story. Sometimes truth is stranger than fiction. October 7, 2010 at 4:27 am. Permalink. What an amazing story!!! Thanx for sharing!!! October 7, 2010 at 5:51 am. Permalink. I would love to have been the first one through the door. I think there are many places like this, left behind and the family just leaves empty because someone doesn’t want to sell it-Napoleonic laws tend to keep things from being sold easily. October 7, 2010 at 6:21 am. Permalink. Thank you for sharing your discovery! October 7, 2010 at 6:22 am. Permalink. It looks like a sofa or chaise. I think it would of been a scandal if she was painted sitting on her bed or any bed back in those days. Wish I could find a place like that. Hope some of the collections went to a museum and the new owner of the apartment keeps the interior intact. March 19, 2012 at 3:04 pm. Permalink. Wow – wish that I could make a discovery like this. I dream of the day that I come across an old house that has been closed for years packed full of lovely French “goodies”. October 7, 2010 at 7:10 am. Permalink. October 7, 2010 at 10:50 am. Permalink. October 7, 2010 at 11:22 am. Permalink. Hello Claudia….What a fantastic story…I wish it could be kept as is…such a fabulous time capsule. I hope all is great in your world, xv. October 7, 2010 at 12:30 pm. Permalink. I completely agree Vicki!!! wow!!! November 8, 2012 at 8:26 am. Permalink. I am thrilled you have posted on this! It is amazing and you are the first site I have found who has the Ostrich image!! October 7, 2010 at 12:32 pm. Permalink. OMG I love it! How exciting to stumble upon such a time capsule. I would have given anything to have been able to troll through that place too. Thank you for such an amazing post! October 7, 2010 at 1:25 pm. Permalink. How exciting to have been there! But that carpet, the mirror, the books I could look at that room for hours. Imagine it just sitting there for all those years, the mind boggles!!! A really lovely post. October 7, 2010 at 1:30 pm. Permalink. I have a recurring dream like this, but it’s my apartment and I finally remember to go there after decades. Really odd, but curiously satisfying dreams. Who paid the rent on the flat? That, to me, is the oddest part. Who would keep paying, but never visit, or clean it out? October 7, 2010 at 2:14 pm. Permalink. OMG! Just look at the way her dress is portrayed by the artist!!! It looks like incandescent gossamer….She is gorgeous!!!! To think that this stuff still happens is amazing!!!!!!!! !Thanks Claudia!!! October 7, 2010 at 2:47 pm. Permalink. A magical, fantasy-inspiring post. Thank you. October 7, 2010 at 3:04 pm. Permalink. How absolutely amazing ~ imagine walking into that appartment layered in dust and then finding this amazing painting~ it’s almost like a fairy-tale. I love the painting it is so… very exquisite! i am still sitting here utterly bewildered after reading this post. October 7, 2010 at 9:36 pm. Permalink. I wan to know more about Mrs. de Florian. This story is marvelous. October 7, 2010 at 11:38 pm. Permalink. I can even see this ability growing over the years,go for it girl. The world needs more stories to uplift our hearts,thank you for this post love Bev. October 7, 2010 at 11:49 pm. Permalink. I’m at a loss for words..
truly a relic from a bygone age..a treasure. October 8, 2010 at 3:53 am. Permalink. October 8, 2010 at 8:24 am. Permalink. WOW! I wish I could find a floor plan of the apartment! One article described it as “Large,” and living in Paris ain’t cheap! … and what more could be said about the beautiful, mysterious, romantic story and the wonderful treasures left behind by Madam de Florian! October 8, 2010 at 9:02 am. Permalink. October 8, 2010 at 9:59 am. Permalink. October 8, 2010 at 1:30 pm. Permalink. It’s so beautiful! The story and the images!!! October 8, 2010 at 4:45 pm. Permalink. I love this story. I wish I would have been the 1st one to open the door . October 8, 2010 at 8:37 pm. Permalink. November 8, 2012 at 8:30 am. Permalink. October 9, 2010 at 2:03 pm. Permalink. What a wonderful story! I especially loved the Clemenceau connection and that all those letters survived. A wonderful project for someone to edit and publish – think of the fabulous details of life during those times. October 9, 2010 at 8:25 pm. Permalink. Oh, this conjures memories… my parents were packrats on a pretty grand scale. After their deaths it took me three years to sort through their belongings and those of my mother’s parents. There was everything that had ever passed through my life as well as theirs– every drawing I’d created as a child, every toy (both mine and hers), love letters written before their marriage while my father was stationed in Korea. Among the treasures I found were a calendar where my mother had noted the day she met the boy who would become my father, sketches she made of him while they were in high school, paintings of my grandmother and sketches of me at two days old. She must have been sketching in her hospital bed. October 10, 2010 at 1:27 am. Permalink. Wow, you also could write a book on your life! What a gift for generations to come! I just love these stories, I am a hopeless romantic, I guess! Blessings! October 6, 2012 at 11:42 pm. Permalink. January 4, 2014 at 3:13 am. Permalink. The dates in this story are all wrong. She was 24 in 1898, so she was born around 1878. Yet she died 112 years after she was 24, at the age of 91? The story says the room was locked away for 70 years. But was that starting in 1900, like the article says, and this room was discovered in 1970? Or was it locked away when she went into exile following the German occupation in 1940, and it’s just been discovered 70 years later? Something doesn’t smell right, and it’s not 70-year-old dust. October 11, 2010 at 6:44 am. Permalink. The artist’s muse and the subject of the painting was her grandmother, “whose granddaughter it was who had left the flat uninhabited”. One expert said it was *like* time had stood still since 1900, which isn’t a statement of fact as to when the apartment was abandoned. October 19, 2010 at 9:13 am. Permalink. If you look at the curtains to the right of the dressing table,they are modern curtains ,not 1920 0r 1930’s,something is not right.What happened to reading the gas and electric.Did no one notice the shutters were closed for so many years. June 15, 2013 at 10:10 pm. Permalink. October 11, 2010 at 10:38 am. Permalink. October 11, 2010 at 1:41 pm. Permalink. October 11, 2010 at 6:53 pm. Permalink. Great post. Love your site, I’ll be back. October 11, 2010 at 8:01 pm. Permalink. October 11, 2010 at 11:34 pm. Permalink. October 12, 2010 at 12:32 am. Permalink. Oh this is marvelous! What a treasure trove. Thanks for posting… you never cease to delight me! October 14, 2010 at 5:17 am. Permalink. This sounds almost too good to be true! What a wonderful story of finding such wonderful treasures held as if in a time capsule. October 24, 2010 at 7:25 pm. Permalink. Just magical…I wonder why she didn’t go back to the apartment; maybe a lost love was involved and yet the place still held her heart? October 27, 2010 at 12:03 am. Permalink. Wow….enchanting! Can you imagine? Just wow! It sounds like something from a fairytale! October 28, 2010 at 3:34 am. Permalink. October 29, 2010 at 2:29 pm. Permalink. November 11, 2010 at 9:47 pm. Permalink. November 27, 2010 at 8:12 pm. Permalink. March 2, 2011 at 12:44 pm. Permalink. April 18, 2011 at 12:20 pm. Permalink. what an incredible find. The Mickey Mouse stuffed animal is pretty awesome. May 15, 2011 at 2:26 pm. Permalink. June 15, 2011 at 3:02 pm. Permalink. September 14, 2011 at 3:56 am. Permalink. I would have love to be the first one to walk into that apartment. So many treasures and history. Interesting that the woman never bothered to go back considering how much she had left behind. Art historians are salivating. September 14, 2011 at 5:07 pm. Permalink. September 15, 2011 at 4:51 pm. Permalink. I love this theory!! I think you’re right. They said it was ‘as if it had been frozen in time since 1900’. 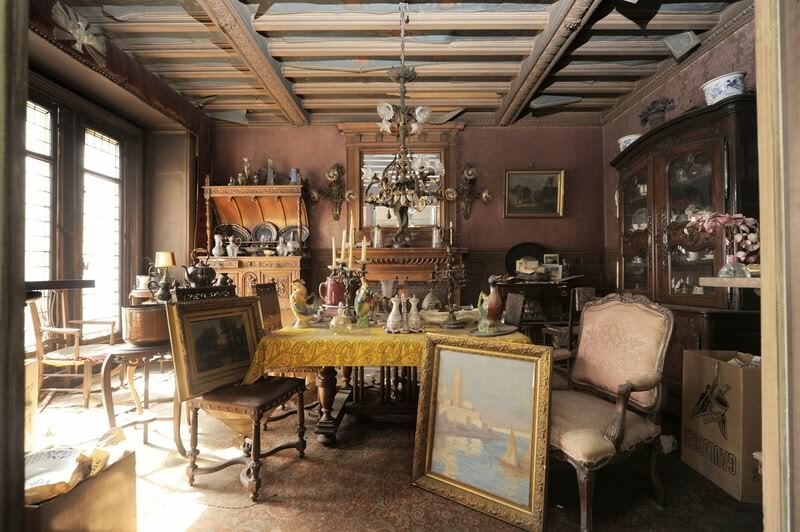 It looks to me (from the article below) that the apartment belonged to the grandmother (Boldini’s muse), and the granddaughter ‘inherited’ it with all of her grandmother’s belongings after she died. Apparently, there was a great deal of wealth in this family, considering it was a ‘large flat’, and you can tell it was well appointed. And, the fact that rent was paid on it for 70 years when she wasn’t even living there! … It was a ‘shrine’ to her grandmother… left intact with the love letters and calling cards of her ‘clientele’. Excellent! May 14, 2012 at 10:16 pm. Permalink. It’s amazing, and so romantic… thanks for this discovery ! September 16, 2011 at 9:05 am. Permalink. Ah, I wish I could have been the one to walk in there first! It’s magestic, I don’t understand why the lady never went back to this treasure alcove. September 18, 2011 at 7:41 pm. Permalink. I can’t get over the stuffed ostrich. September 19, 2011 at 7:57 am. Permalink. September 19, 2011 at 11:05 am. Permalink. September 20, 2011 at 1:24 am. Permalink. “That money better have been put to a good cause”….or what? Just enjoy the post without getting political and ruining it for others. December 13, 2011 at 4:14 pm. Permalink. That money belongs to the family and they may use it any way they see fit !!! Who the hell are you to say what they do with their money? A NOBODY !! December 9, 2012 at 8:38 am. Permalink. Thanks to the previous 2 ladies for their ‘to the point ‘replies! January 4, 2014 at 3:20 am. Permalink. September 20, 2011 at 2:30 pm. Permalink. I live near Paris and I just want to say: why it’s not me? September 22, 2011 at 7:54 pm. Permalink. September 25, 2011 at 6:01 am. Permalink. Fairy tales really do come true for some people, who have left behind magical mementos from their lives. Wonderful true story! October 2, 2011 at 2:12 pm. Permalink. October 13, 2011 at 4:01 pm. Permalink. Oh my God, it’s like a dream. Absolutely beautiful! October 13, 2011 at 8:06 pm. Permalink. November 3, 2011 at 8:25 pm. Permalink. SO what you are saying is that all these items were kept safe by her until she died, then everyone went in a ransacked her possessions…I hope the family got the money at least. If I were her I would be haunting some people. November 18, 2011 at 7:57 pm. Permalink. Well at least they got photos of the place. What should they do? Keep it as a museum? November 18, 2011 at 8:59 pm. Permalink. If they want to, it’s a time capsule. One that I would love to see. December 9, 2012 at 8:42 am. Permalink. je passe boire le cafe quand je passe a paris ! November 25, 2011 at 5:56 pm. Permalink. There is a certain key phrase in the article that makes this a bit less romantic. The key word here is “demimondaine” which carries roughly the same meaning as courtesan or a high-class prostitute. December 4, 2011 at 4:03 am. Permalink. Eh, Gigi was still a romantic story, and she was a demimondaine. Sure, in reality, I’m sure it wasn’t really romantic because of that, although she may also have just been someone’s mistress (which fits into the definition of the word). I bet there’s quite a story there, though, if she left suddenly and never returned. January 12, 2012 at 1:34 pm. Permalink. January 4, 2014 at 3:24 am. Permalink. Oh that is a bit torrid and maybe not even accurate. I wonder what prompted the use of that word? Who was she exactly with everything from Mickey Mouse to taxidermy in the apartment?! December 4, 2011 at 3:48 pm. Permalink. January 4, 2014 at 3:28 am. Permalink. I have done some more digging. Seems She was an actress as well as a high-level prostitute. And I have not been able to dig up any information on the type of acting. Ideally, the best person to converse with would have been the now deceased grand-daughter who was paying the rent on the flat. There has also been no mention that I have seen to indicate any surviving family members. Further digging suggests that Boldini did not have any children either since he did not marry until he was 86. No mention of any offspring in any of the articles that I have read so far. The love letters that are mentioned in the above article could be handy in determining more of the story. The love letters seem to have been of a racy nature as mentioned by the French Press. There were calling cards from senior statesmen within the flat, and according to the article I have read on http://www.mysinchew.com/node/46082, she hosted many lovers within the flat. December 4, 2011 at 5:34 pm. Permalink. Wow that is really interesting stuff! Fascinating! Funny that I have not seen a thing since the article was written either about her or what happened to the contents of the apartment. I have a feeling there’s a story there. Maybe you’re the person to uncover it? Thank you so much for this, it’s really juicy and gets my imagination going. Please let me know if you pursue this any further! December 5, 2011 at 3:47 pm. Permalink. December 7, 2011 at 1:23 pm. Permalink. December 29, 2011 at 6:52 pm. Permalink. The information available here is very great. Keep the flow going on. February 23, 2012 at 8:33 am. Permalink. What a great story and find, but so many questions. Why did she not come back?? Was everything sold?? Did anything go to a museum?? Was the apartment sold or rented to another tenant?? Is the interior still intact?? Regarding the rent, was there rent control over the years?? Renting a large place like this is very expensive. The owner, amazingly over 70 years would have the right to access of the apartment if something went wrong, such as a broken water pipe. Seeing the water damage in one photo, would suggest that the water went into the unit below. The photo’s look staged. I can’t see the window treatments open for 70 years. The sun light would of damaged the fabrics, paintings and furniture. Also, it was customary to cover furnishings if you were not going to be there for some time. Lastly, amazingly, no one broke in there?? Including the Nazis, they would of took what they wanted and lived in such a fine place during the war. Hope someone writes a book about this families history. Thanks for the posting this…………. March 19, 2012 at 3:30 pm. Permalink. I note that the curtains to the right of the dressing table look of a modern design,pre war curtains were not like that they would have been cotton lace,and I am sure they would be faded and rotted.Looks wrong to me? May 20, 2013 at 12:36 pm. Permalink. I’m also having a hard time believing that anyone fell for this obvious hoax. But I guess we all believe what we want to believe… and art auction houses certainly aren’t renowned for their integrity! March 8, 2014 at 7:38 am. Permalink. 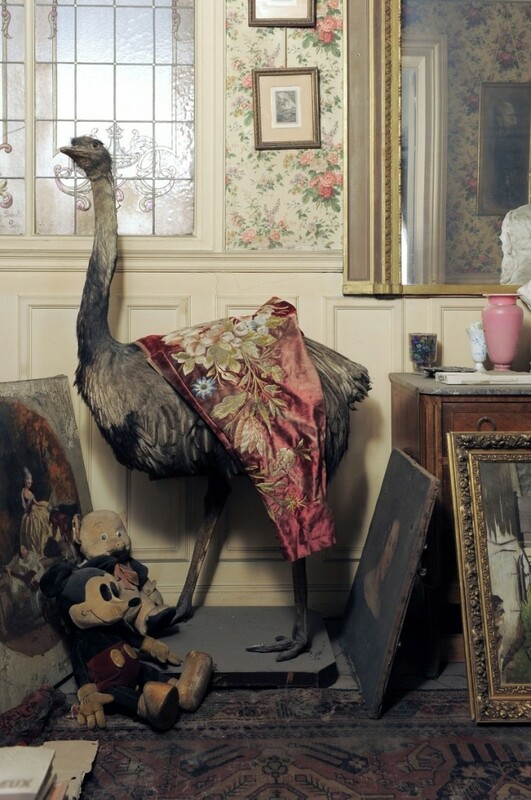 No one has mentioned the incredible picture of either a small moa (long extinct NZ bird) or emu with a satin cosmetic jewellery encrusted shawl just thrown over it – now where and why did that come from?? May 12, 2012 at 6:48 pm. Permalink. July 11, 2012 at 5:34 am. Permalink. Very intresting story ..Everybody is going that way sooner or later. (hope later . July 24, 2012 at 3:46 pm. Permalink. January 4, 2014 at 3:34 am. Permalink. October 2, 2012 at 7:29 pm. Permalink. Please tell us more about the love letters. They are a lost art. October 6, 2012 at 10:04 pm. Permalink. October 20, 2012 at 11:20 am. Permalink. This is the type of apartment I want to live in for the rest of my life. December 27, 2012 at 1:36 am. Permalink. Well, mine has just about that much dust but the contents are far less interesting . . .
May 13, 2013 at 2:28 pm. Permalink. LOL … love your sense of humor! January 4, 2014 at 3:36 am. Permalink. February 6, 2013 at 3:51 pm. Permalink. March 8, 2013 at 9:03 am. Permalink. London was at his peak after he published White Flag and Sea Wolf. than two years, and at a fraction of today’s costs. April 12, 2013 at 2:44 am. Permalink. […] apartment untouched for 70 years. urban archaeology: sleeping beauty’s paris apartment discovered | the paris apartment Wonder why this wasn't big news a few years ago. Just discovered it. April 27, 2013 at 4:36 am. Permalink. however I to find this matter to be actually something which I think I’d never understand. It sort of feels too complex and very large for me. I’m having a look ahead in your next put up, I’ll try to get the dangle of it! May 6, 2013 at 4:18 pm. Permalink. next to the mouse is that Porky Pig ? May 12, 2013 at 12:28 pm. Permalink. May 15, 2013 at 8:23 am. Permalink. May 16, 2013 at 6:13 pm. Permalink. Perhaps it should have been kept intact.Sir Roy Strong is leaving his property to the Nation,but that is England and not France. May 20, 2013 at 12:23 pm. Permalink. The net curtains next to the dressing table look modern,they would have been in cotton net,those look to white,and not discoloured ? May 20, 2013 at 12:24 pm. Permalink. May 20, 2013 at 1:03 pm. Permalink. June 15, 2013 at 2:21 pm. Permalink. What i do not realize is actually how you are not actually a lot more neatly-appreciated than you may be now. unless it’s one thing to accomplish with Lady gaga! Your personal stuffs great. Always handle it up! July 18, 2013 at 9:24 am. Permalink. useful to them, through the following on Twitter or “taste” of your Facebook page. that they will help them solve. They focus on all the parts which are important for internet marketing. July 22, 2013 at 12:04 am. Permalink. This website was…how do you say it? Relevant!! Finally I’ve found something that helped me. September 30, 2013 at 3:56 pm. Permalink. November 8, 2013 at 5:06 pm. Permalink. January 4, 2014 at 4:29 pm. Permalink. Is there a place to see more photos of this, I hope that it can be left as is or moved and displayed in a museum. I am so intrigued by these photos, it gives a real glimpse into the life of how someone lived at that time. January 5, 2014 at 2:08 am. Permalink. @Bob, I completely agree!! I wish they would do that, but I don’t know if they did or not.I was thinking the same thing and same way.I would have loved to see the inside and see how she lived back then. Talk about a time standing still,wow!! Talk about an amazing sight,wow!!!! A time capsule indead! January 5, 2014 at 7:42 am. Permalink. January 8, 2014 at 11:41 pm. Permalink. I know this is an article, but I need to know more. Just fab story. Please someone tell me there is more …..
January 12, 2014 at 1:45 am. Permalink. *sorry should’ve read, OLD article. January 12, 2014 at 1:46 am. Permalink. January 25, 2014 at 3:10 pm. Permalink. “Чьи руки бережные трогали твои ресницы, красота? February 14, 2014 at 4:39 pm. Permalink. February 23, 2014 at 7:44 pm. Permalink. April 27, 2014 at 12:47 pm. Permalink. Awe, please, we should just charter a plane, to allow all our wishful thoughts to come true. To be able to walk into this remarkable place and stand in wonder , to have our hearts feel , our minds drift into a time, when we may / or may not have been yet born. Our sight will give us the gift to cherish and the memory of being part of something that was saved. 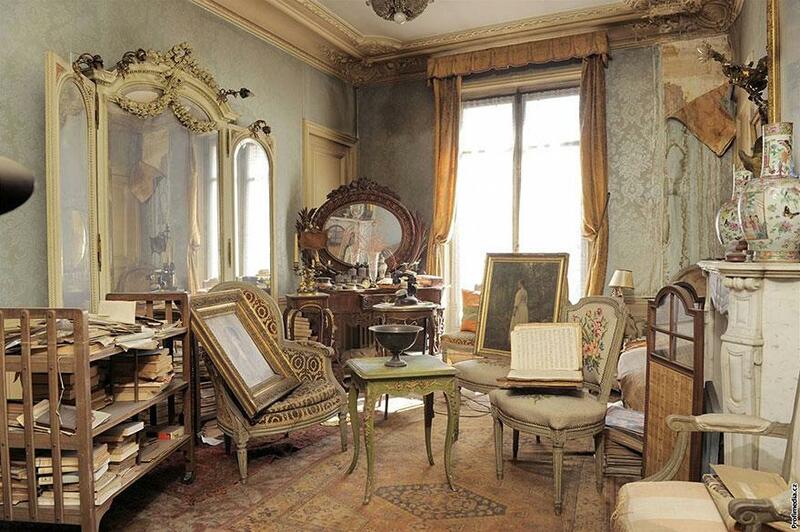 If I could just go and participate and see the untouched Paris apartment. June 17, 2014 at 10:59 pm. Permalink. I completely agree with you Biddle! It just needs to very carefully dusted all over the apartment,but make sure everything is left just as it was found,roped off inside in certain areas that should not be touched but is ok to see it and take pics if they are desired. But that apartment NEEDS to be preserved!!! I would love to see that place!!! OMG,WOW,what a sight that would be!! !Time has definentally stood still in that apartment,for sure!! Despite all the dust, wow! It’s AMAZING And BEAUTIFUL!!!! June 18, 2014 at 12:44 am. Permalink. Thank you for the response. I thought I stood alone as I was so taken and smittened when first reading this story. You are absolutely right. It should be preserved. Can`t imagine just leaving. To watch an old Nazi movie , one would vision this young girl fleeing from all the fear of seeing the Nazis caring their gear. OMG. Is right. If I had cash on the mahogoney, believe, those tickets would be bought just to walk down the street Dont know what floor this apartment was. But to look at the carved woodwork furniture. Yes rope off tour guide. Dusted. You are right. June 19, 2014 at 12:12 am. Permalink. This unbelievable, believable story with extraordinary paintings, just about everywhere to be seen. The absolutely beautiful painting of, if I read correctly, of her grandmother. Now, for a moment of thought, just for that slight few seconds, did anyone look behind any of those paintings. Like, did the experts, remove the frame and take the back off to see, if any, yet another big wilderment? Or, in those days, were the paintings done without a back for support with frames? Not sure in those days would glass be with a framed picture or painting? OMG, just think, another hidden treasure to surprise everyone. I would never question the honesty on this story. This reason being everything appears outdated. Awe, look, where big bird is standing by his/her hind legs, looks like Mona Lisa painting??? leaning against dresser. June 19, 2014 at 1:55 am. Permalink. July 12, 2014 at 4:30 am. Permalink. August 19, 2014 at 4:53 am. Permalink. June 5, 2016 at 4:11 am. Permalink. April 4, 2018 at 3:37 pm. Permalink.